A collection of fun fabric Valentine projects. How do you celebrate Valentine’s day? Here are some craft ideas to help you get ready. We are shaking it up a bit this week with the features. I get to feature all of my favorite fabric link ups so that means that Emily from Nap-Time Crafters will be featuring Crafts, Amy from Marvelous Mommy will be featuring Food, and Gina from Kleinworth & Ko will be featuring DIY. 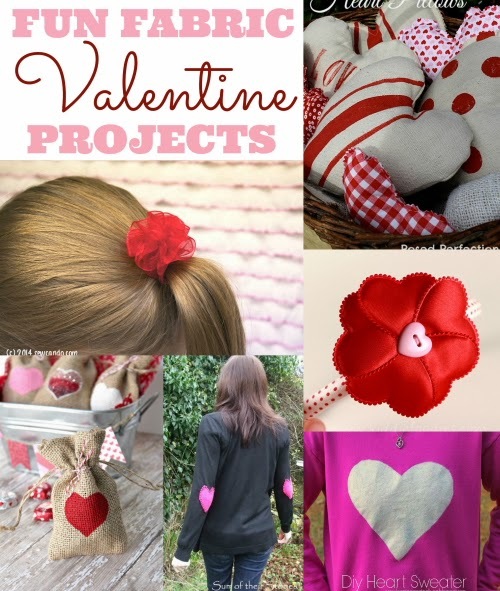 So here are my favorite Valentine Projects that were posted from last week. Thank you for linking up at This~N~That Thursday at Through the Dutch Door! I love the little burlap bags! Love these ideas!! Stopping over from Bewitch link up.